Home / News / Shock as UHURU and his team are kicked out of office in Nairobi by irked youths-Did ex-President MWAI KIBAKI send them? Shock as UHURU and his team are kicked out of office in Nairobi by irked youths-Did ex-President MWAI KIBAKI send them? Wednesday September 12, 2018-A team of Jubilee Party officers was unceremoniously evicted from one of their Nairobi branch offices by former President Mwai Kibaki’s Party of National Unity(PNU). This follows a court order that gave the PNU officials the guts to kick out President Uhuru Kenyatta’s party officials from the premises. 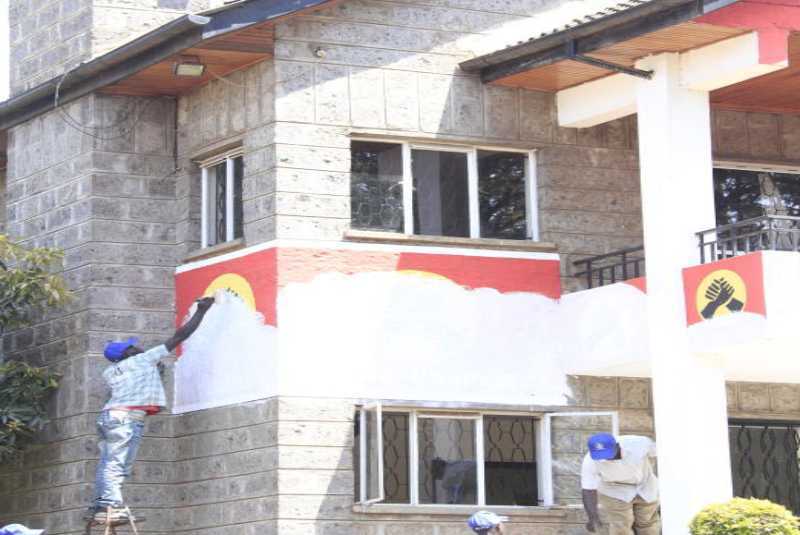 The irked youths donning PNU caps threw out furniture belonging to the Jubilee Party from the one-storey building located along Musa Gitau Road, while another group scrubbed walls to remove Jubilee colours. According to John Okemwa Anunda, who is the PNU Secretary General, they have reclaimed the office which was handed to Jubilee late 2016. The officials who were backed up by police officers stated that the previous residents were not welcome there anymore. “Tunataka kuambia Raphael Tuju akae kwake, hapa si kwake (We want to tell Tuju to stay away, this is not his property)," stated the PNU Secretary General.